Combining accessories with the rest of your outfit is basically a mine field where only good taste can guide you. However in terms of accessorizing keeping your choices simple and restrained will take you far. Therefore it is good to learn how to combine ties and pocket squares. 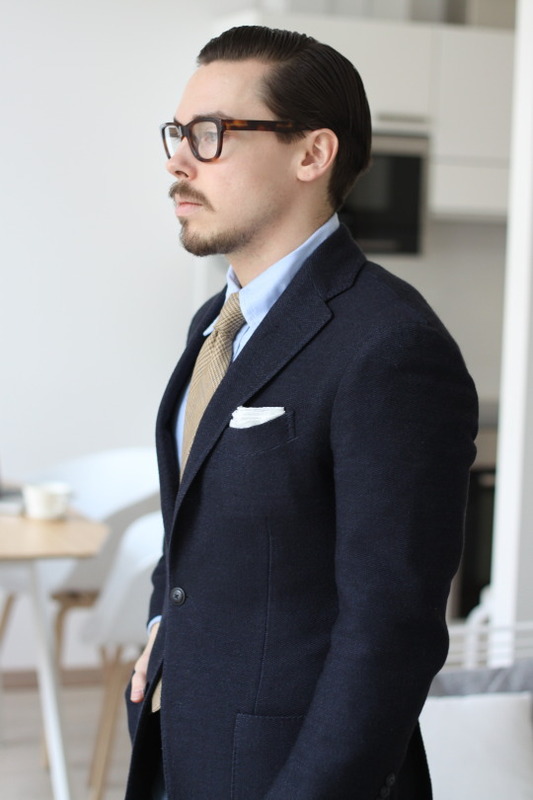 In this post I briefly show you how to combine different kind of ties and pocket squares. And I do it with four different ties and two pocket squares. As you know, the three most essential ties every man should have are navy blue grenadine tie, brown shantung tie and gray wool tie. In general I personally value plain ties with interesting textures. However, instead of those three I have here chosen four ties that are good options to complement your tie rotation. How to combine ties and pocket squares? Remember to keep your combinations simple and restrained. As mentioned, the selection here includes four ties and two pocket squares. I did the selection to cover as many occasions as possible, where a man might need to wear a tie and a pocket square. First of all I chose dark blue polka dot made of shantung silk to wear at formal parties. I picked navy blue printed silk tie for formal business wear and brown grenadine silk tie for business casual. Finally I chose a wool tie with prince of wales check for more casual occasions. The pocket squares are both made of linen. The first one is white with blue contrasting borders and the other one blue with small white dots. Next I will go through four different looks how to wear them and give some tips how to combine them. In terms of ties a dark or navy blue tie with white pin dots is a classic choice. It suits almost every occasion except funerals or the most formal celebrations. If you don’t want to buy a grey or silver grenadine tie for occasions where a dark / lounge suit is required, go for this one. The tie here is crafted from shantung silk which is famous for its natural slubs that gives texture and a rustic feel to the tie. Untipped finishing and hand-rolled edges gives the tie even a bit more lighter and sophisticated feeling. This particular tie ties a good looking knot and it’s also easy to get a dimple to it. This of course only in case you prefer doing a dimple. Are you are looking for a classic tie that is versatile and suitable for many different kind of occasions? If you are, a navy blue with pin dots is a choice worth to consider. It is easy to pair with suits and sport coats ranging from blue to grey and brown. It also goes well with shirts from white to light blue and pink. And when you wear it for the more formal purposes – don’t do like I have done in the pics – don’t wear a button-down collar. I’m personally not the biggest fan of small pattern printed silk ties. But I know there are many who consider them as perfect business ties and that they admittedly are. And as most of you know, there are multiple manufacturers that are especially known for making this kind of ties. Here I have a small pattern printed silk tie in navy blue with blue and brown cornflowers. In ties I’m more fond of tones of blue and brown as they are easiest to combine with the suits and shirts I have in my wardrobe. Therefore most of my ties feature these colors. Despite that it is good to remember that tie can be the contrast piece in your outfit as well. So if you like colors like orange or red, printed ties are good place to use them. This tie is untipped and finished with hand rolled edges same way as the one above. I mentioned above that dotted ties are versatile. However I personally feel that they are more business- or formal wear-oriented. On the other hand printed ties like this one can be easier worn as well with casual sport coats for example. This kind of a tie is in fact a staple for guys who wear a suit or sport coat for work 5 days a week. It is a easy way to bring a little contrast and variability to your rotation. For these two first combinations I chose to wear a plain white linen square with blue contrast edges. Once again I recommend this, invest in versatility. Every man needs a pocket square that can be used as white tv-fold. If you choose a plain white with contrast edges instead of one that does not have those edges you get an option that can be used in various ways. Do you only want to have one pocket square in your selection? If your answer is yes, I suggest you put your money on this kind of an option. My third choice here is a brown grenadine tie. But this one is a bit different than most grenadine ties. This particular tie is crafted from garza fina grenadine. Garza fina grenadine is an open weave textured silk with a deep and interesting look. The difference in terms of garza fina and garza grossa grenadine is that the garza fina has – as the name suggests – a finer weave than the maybe a bit more traditional big knot grenadines (garza grossa). What makes this particular tie to differ from many others is that the model features a bicolour dotted design that is woven into the tie. The design includes chocolate brown and navy silk yarns which gives the tie interesting, more unique and depth look. In general brown grenadine silk is once again a safe choice. First of all you can pair with a range of colors from blue to shades of brown. And you can even combine it with orange or purple. On the other hand it goes with different materials from fine wool to more heavy flannels and lightweight linen. Here you can see it with patterned business suit, light blue button-up shirt and a navy blue pocket square that also features a dotted design – in a much smaller scale. For a fourth tie – to conclude my quartet I wanted something a bit more casual. I wanted to pick a tie that you can wear easily with button-down collars, jersey jackets and denim. Therefore I ended up choosing a tie crafted from a blend of linen and wool, featuring a classic prince of wales pattern. Regarding this particular tie I like the combination of linen and wool. Sometimes I feel that linen ties can feel even too light and kind of wobbly. With this kind of fabric the little mixture of wool brings a nice touch of solidity to the tie. This particular piece is self-tipped which also strengthens the structure of the tie. The pocket square I used in these two latter combinations is blue linen square with white dots and white contrast borders. Again it is a pocket square that has at least three different kind of ways to be wear and combine. All the squares and ties in this article are basically appropriate to be worn and combined together. So with these four ties and two pocket squares you already have 8 different combinations available to choose from. If you in addition take one white and one light blue button-up shirt as I have done here, one navy blue and one sport coat you have increased the amount of possible combinations to 32 (4x2x2x2). Finally I give you four rules to remember when you combine your ties and pocket squares with your outfit. And if you want to look for more inspiration on how wear different kind of combinations, check out the posts below. Original post 4/2015 – updated 11/2016.